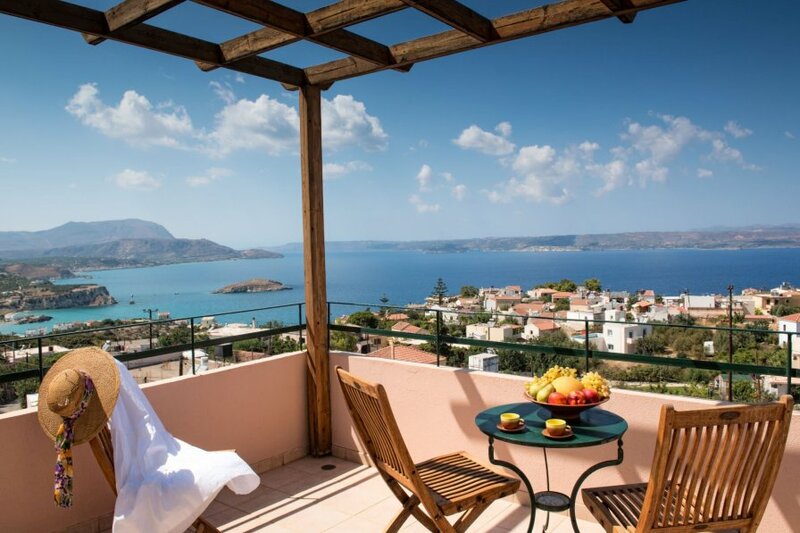 This 3-bedroom villa for up to 6 guests is located in Plaka (Elounda) and has a private swimming pool. Plaka 10 km from Chania: Very beautiful villa Afroditi, 3 storeys, built in 2004, renovated in 2016. On the outskirts, 200 m from the centre of Plaka, 2 km from the sea, 2 km from the beach. Private: property 135 m2 (fenced), beautiful garden to relax, swimming pool fenced (28 m2, 01.04.-31.10.). Terrace, barbecue. In the house: internet access, WiFi, air conditioning, washing machine. Linen change 2 times per week. Towel change 2 times per week. Room cleaning 2 times per week. Parking, single garage. Shop 300 m, supermarket 2 km, restaurant 300 m, bar 2 km, bakery, cafe 300 m, bus stop Plaka 300 m, sandy beach Almyrida 2 km. Please note: car recommended. Baby equipment on request (included). Afroditi, 4-room villa. Bright, comfortable furnishings: large living/dining room with 2 sofabeds, satellite TV and international TV channels (flat screen), CD-player, DVD and air conditioning. Exit to the terrace, to the swimming pool. Kitchen (4 ceramic glass hob hotplates, microwave, freezer). Bathroom, shower/WC. Upper floor: 1 double bedroom with 1 double bed and air conditioning. Exit to the balcony. 1 double bedroom with 2 beds and air conditioning. Exit to the balcony. Bathroom, shower/bidet/WC. 2nd upper floor: open gallery with 2 beds and air conditioning. Art nouveau furniture. (portable). Panoramic view of the sea, the mountains, the swimming pool, the countryside and the bay. Garage on the property. Suitable for families.